« Snake Wrangling……been there, done that !!! 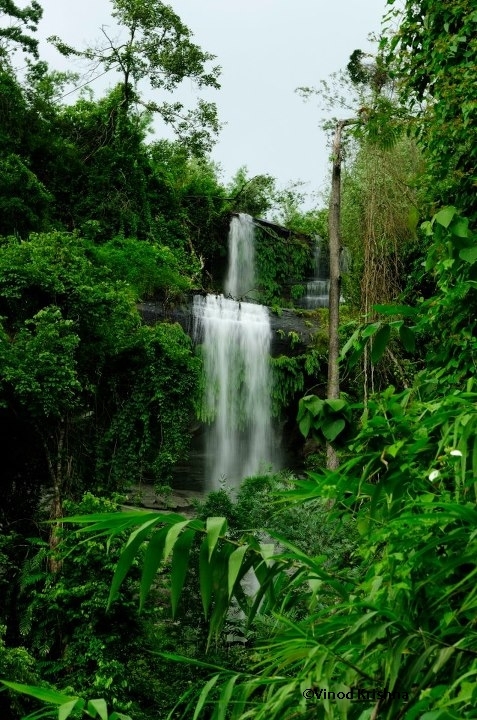 Mysterious Mizoram…Land of the blue mountains. “Best-laid plans of mice and men often go astray” there is no better way than this to explain our trip to Mizoram last month (9th to 15th August 2012). 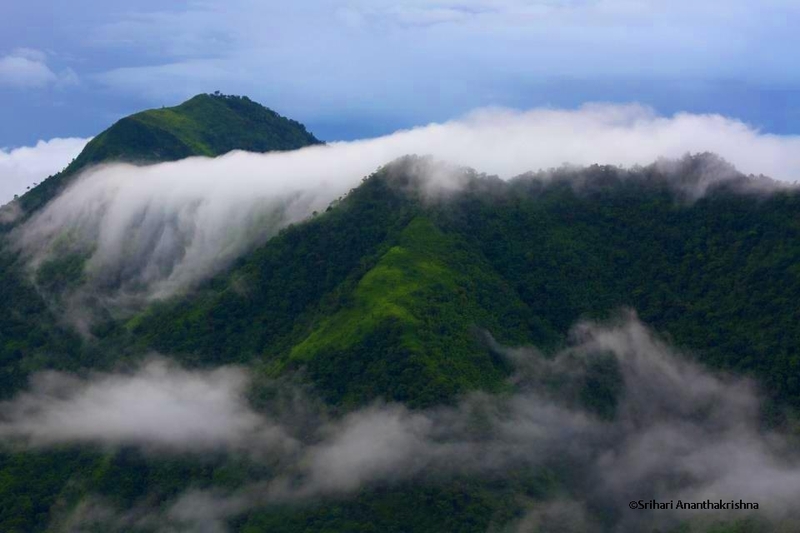 It is not called as Mysterious Mizoram for nothing! These lands of Blue Mountains welcomed and wrapped us (a bunch of 10 people) in her folds while we watched the blue skies smiling at us. Now wait it was monsoon , all of us were dressed top to toe in rain gear but a bright, sweltering sun sucked up our energies and hopes as soon as we set our foots in Aizwal. We were all dazed and exchanged helpless glances at each other. Seeing juvenile king cobras from Mizoram was a first timer for me and they looked very similar to their counterparts in the Western Ghats. On the third day when the rains still remained behind black clouds we decided it was time to go up the mountains with minimal gear. We trekked up the Reiek Mountain, home for fascinating variety of hill birds. No sooner did we take our baby steps the clouds broke loose and we stood in dismay. Now this was what rains looked like in Mizoram. Trekking steep slippery slopes was a challenge and by the end of it, all of us had slipped and most fell but everyone had laughed their guts out. It was fun! Mizoram had a knack of throwing surprises at us and probably enjoyed looking at our faces every time. Our plans to visit the Dampa Tiger reserve, Murlen National Park and the Champhai town all came crashing down with a landslide on those routes. 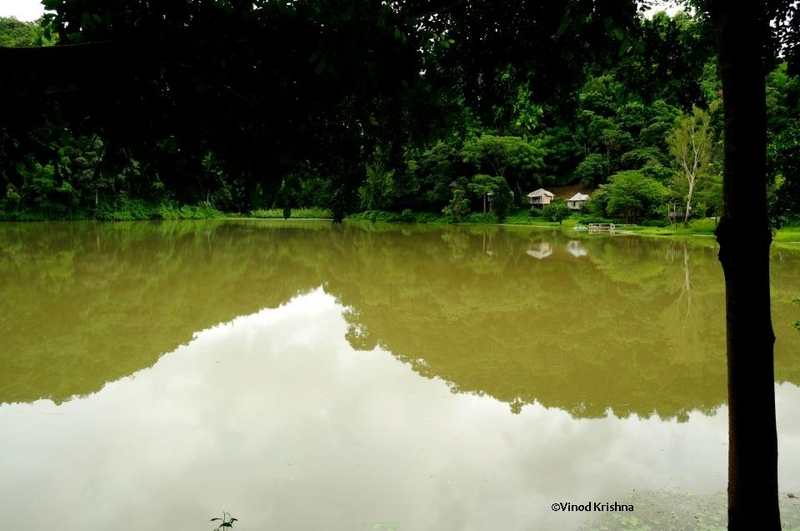 So our next destination was a place totally unheard of, the Tamdil Lake. 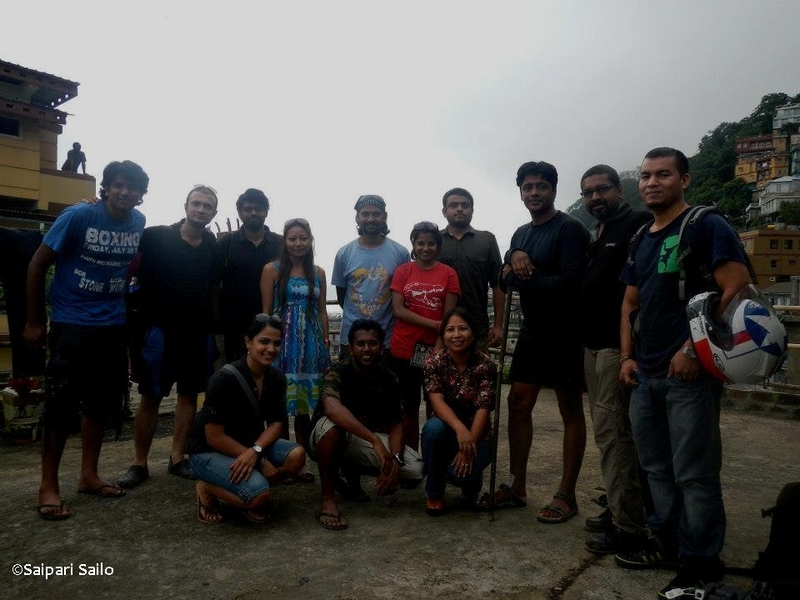 But this time we were glad and thanked Mizoram for her plans. Tamdil lake nestled among towering trees was beauty unmatched. For the next two days we explored new paths into the forest and discovered amazing life. 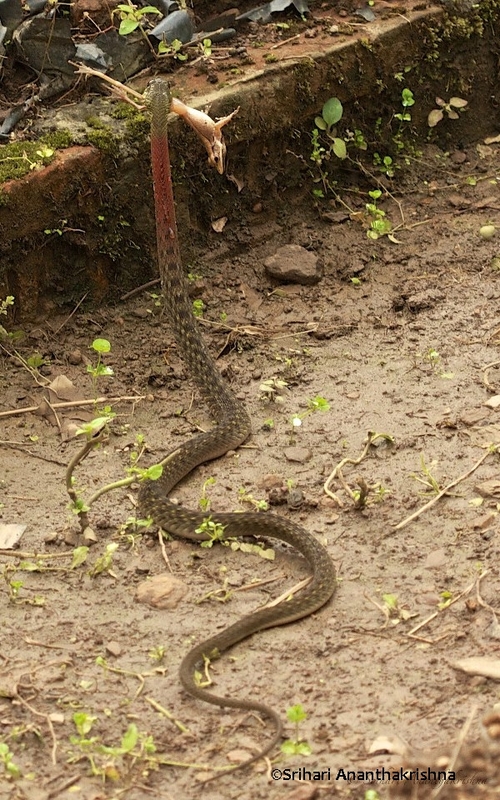 Apart from myriads of birds, butterflies, beetles, spiders, crickets and fungi, our primary focus on snakes yielded us sightings of a Juvenile Cherrapunji Keelback (Amphiesma xenura),Red-necked Keelback (Rhabdophis subminiatus), and a Checkered keelback (Xenochrophis piscator).The highlight was witnessing a Red-necked Keelback (Rhabdophis subminiatus) hunt a frog and swallow it. A Red-necked Keelback (Rhabdophis subminiatus) with its meal. Travelling these picturesque hills is a pleasure but seeing road kills is not. Road kills included an Indo-chinese Rat Snake (Ptyas korros), Black Krait (Bungarus niger) and a White-barred Kukri Snake (Oligodon albocinctus). 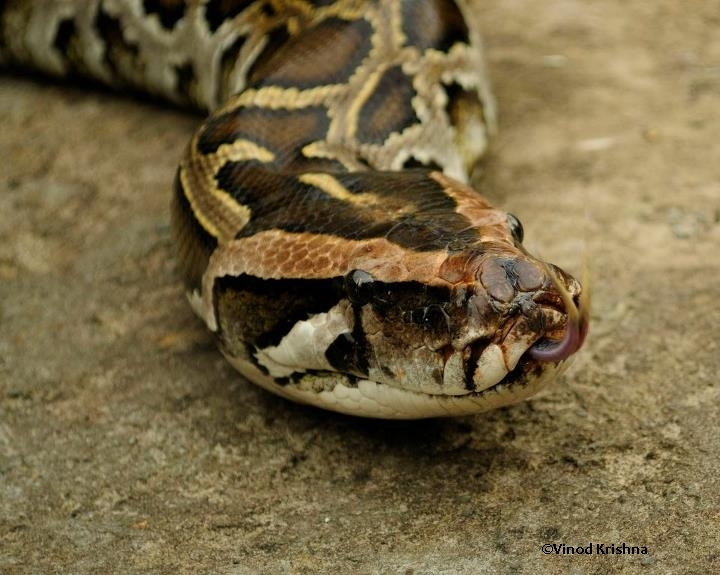 Back in Aizwal we got to see a female Burmese python (Python molurus bivittatus) at a friend’s place and a Yellow-speckled Wolf Snake (Lycodon jara) at Hrima’s place. On our way back to the airport we witnessed an accident where a motorcycle dashed into a jeep. Believe it or not none of the drivers raised their voice or bad mouthed the other and there was no commotion whatsoever. All they did was clearly marked the accident spot, each one called their bosses and settled things peacefully. This is an attitude that everybody all over India need to learn and emulate. Women here seemed to be far more enterprising and managed most business centers. I personally felt that Mizoram seemed to have a fairly advanced society compared to other states in our country. I want to specially thank H.T.Lalremsanga, Siama, Hrima, Lindaji (a multitalented celebrity and extremely kind lady who is a model, rescues snakes and a great singer), for their help and support, Saipari Sailo who took us shopping in Bara Bazaar and all my friends who rolled up their sleeves for all our unplanned adventures. We bid good bye to amazing Mizoram towns and watched life go by with guys on roads, their T shirts folded up till their chest washing their super cool bikes, stylish carefree ladies walking along, and kids playing on road sides. A very different life style, very lovely and hospitable people, interesting cuisines, extremely rich wildlife and wonderful landscapes, all this made our trip to Mizoram one of the most memorable one…once again. We will be back next year and I am sure more surprises awaits us! Tats a realy beautiful pictures and good naration i hope u enjoyd tat and wish all da best ! Beautiful notes and photos….So sad i cound’t be there, when you guys came, I got the information, but was busy that time..N’way thnx, hope u guys enjoy u’r trip…… Hope to see u next time…. Missed this trip…..sure to make it next time…. :-)…..
Hi Sharmila and Gowri Shankar.. I spent three years in Mizoram (2004 – 2007) and had the opportunity of rescuing over a hundred snakes – most of them green pit vipers, monocled cobras and copper headed trinkets, but also short nose vine snakes, rednecked keelbacks and a few others including a Burmese python. Had the privilege of rescuing two Burmese ferret badgers that had fallen in a pit and of having a pair of noisy Tokay geckos in my house. Have taken many pics and would love to share them. Currently in Imphal. My recent rescues include a black krait, spot tailed pit viper and chequered keelback – all from a very remote part of the state. Will be here for another two years and have access to the whole state- would welcome anyone who chose to visit !! Thanks Chris. Good to hear from you. We will probably make a trip to the North East next monsoon and it will be great to meet you. We will get in touch with you closer to date. I was in aizawl(Melthum) for 3 years(2007,2008,2012) and was facinated by the number of snake species that the area holds but also saw a big decline in the latter year. Its very good to know that you all are working to spread your message of conservation in the northeast. Very informative post. Thanks for sharing the pics. Sir, I am Saisudha Multani working in an NGO which is dedicated to providing quality education to rural schools in India. We provide quality teaching material and aids to rural schools in India. 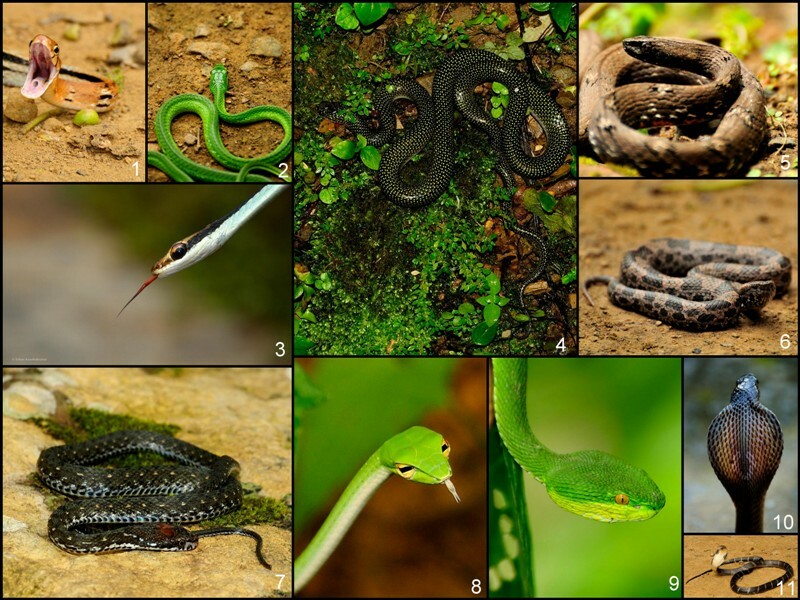 We wanted to use the pics in the Lesson Plan for teachers for the Chapter What do you know about snakes Std V Science CBSE which will be published in the public domain. In this connection, we request you to grant us permission to use the photographs to show to the children. We will be grateful to you if you could help us in this regard.